This unique hook was designed by a bass fisherman who wanted a better hook to use on his poppers. The wide-gape bend is very effective at holding bass once they are hooked because the spear of the hook angles back towards the eye of the hook. This bend shape allows the popper or fly manufacturer to attach a small loop of stiff nylon monofilament at he bottom of the bend and just behind the eye to form and effective weed guard. This is the hook of choice for bass and panfish poppers and deerhair bass flies. 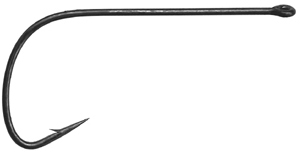 Category: 2720/2722 Wide-Gape "Stinger Hook"